Organizing your events is simpler than ever! Our sign ups make it easy to collect money online from group participants — saving you from sending out yet another email asking for payment. That’s genius! Donations for fundraisers such as capital campaigns, school needs, disaster relief and more. Group gifts for a birthday, baby shower, coach or teacher appreciation. Ticket sales for theater performances, festivals/carnivals, raffles and school dances. Fees for after-school activities and tutoring, fitness classes and pop-up classes. Registrations for 5K races, summer camp, dance classes and sports tournaments. Product sales for spirit wear and direct sales companies. First, you’ll need to log in to your account and go to “Collect” on the left side of your Sign Ups page. Click the “Get Started Today” button to begin the account setup process. The first step will prompt you to create an account with our payments partner, WePay. A screen will pop up with your name and email already entered — you just need to create a password. Hit the “Grant Access” button and move to the next step. Select who will receive the money collected: an individual, nonprofit or business. This will determine how you enter bank account information. 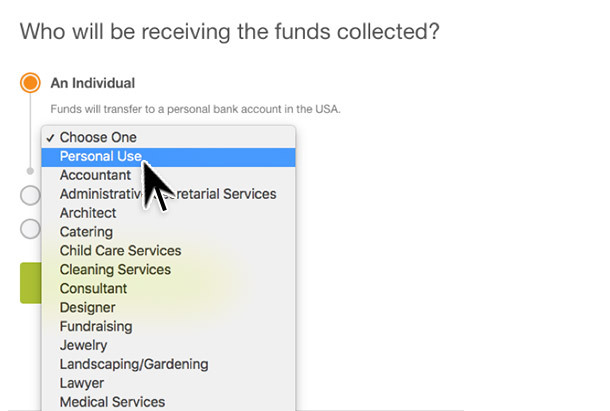 If collecting money as an individual, simply choose a reason why you are collecting money from the dropdown menu. A nonprofit or business will choose its type of organization or industry. Next, you’ll enter some basic identification information. If you’re collecting money as an individual, you’ll give the last four digits of your Social Security Number. If collecting money for a nonprofit or business, you’ll enter the Employer Identification Number. Lastly, enter banking details (routing and account numbers, bank name and account type). Choose how often you want WePay to deposit the money in your account — daily, weekly or monthly. We recommend choosing “Daily” in order for you to receive your funds as quickly as possible. You can choose to have your money as a check instead of a direct account deposit if you provide your mailing address. Cha-ching! Your Collect Money account is active and ready to collect stacks on stacks. To add payments to your sign up slots, click the green button to Create a Sign Up. In Step 4: Slots, check the box under the “Pay $” column to set up the payment feature for the slot and enter details about the payment. 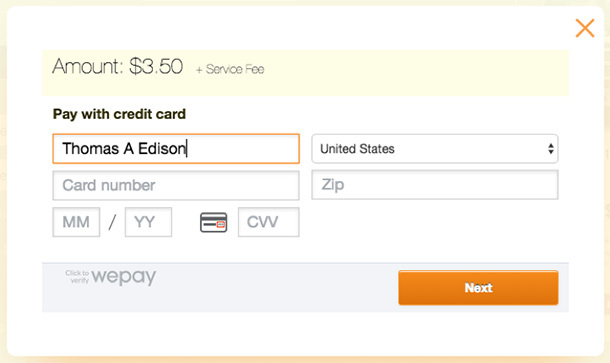 Select whether the payment is required or optional and enter the fixed price, if applicable. The minimum price for any item is $3.50. 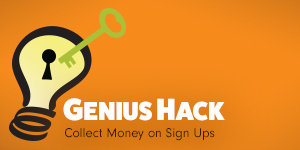 When participants sign up for a slot, they can immediately pay with a credit or debit card without needing to set up a SignUpGenius or WePay account. We charge a low fee of 5 percent of the purchase price plus 50 cents per transaction. There you have it! A genius, simplified way to organize people and collect money at the same time. Now let the moola roll in. Thank you for the mini training session. It was very informative. Group gifts for a birthday, baby shower, coach or teacher appreciation present.